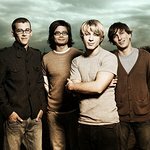 Tenth Avenue North comprising members Mike Donehey (lead vocals/acoustic guitar), Jason Jamison (drummer), Jeff Owen (electric guitar/background vocals), Ruben Juarez (bass) and Brendon Shirley (keys) first impacted the music community as the best-selling and most played new Christian artist of 2008. In 2009, the group scored No. 1 on Billboard’s Hot Christian Songs Artist Chart with “By Your Side” and reached No. 3 overall for the decade. The breakthrough song recently achieved digital Gold status, according to the RIAA, signifying 500,000 singles sold. Such acclaim earned Tenth Avenue North the New Artist of the Year title at the Gospel Music Association’s 40th Annual GMA Dove Awards. The band’s sophomore effort, The Light Meets The Dark (May 2010), debuted at No. 1 on the Nielsen Christian SoundScan chart and produced Billboard’s 2011 No. 1 Christian song of the year, “You Are More.” In 2012, Tenth Avenue North released its anticipated third album The Struggle on Aug. 21, with the first single, “Losing,” peaking at No. 2 on the Billboard NCA radio chart. To date, Tenth Avenue North’s debut album, Over and Underneath, has surpassed 420,000 sales, while the band’s combined album sales total more than 700,000. Google trends for "Tenth Avenue North"
We don't have any videos related to Tenth Avenue North.